I enjoyed this book very much. I loved the first person writing that switched between characters and the true History of the book that combined with heart racing thriller fiction. The event I liked the most was the Murder of Father Grigory Rasputin. It was a dramatic scene that showed the reader that foul play was at work in Prince Yusupov's castle. The book did an amazing job keeping with its history period: The 1918 Russian revolution. It kept the reader well informed of every important event and added a few fictitious events that, even though they were not real, never strayed from the history of it. The book made me very interested in The Russian Revolution and therefore prompted me to read more about it and even led me onto George Orwell's works on the later history of Russia such as Animal Farm. I didn't really feel enticed to read more books by Miss Breslin as I am more into the history than her style of writing. I think that the history in this book is rather accurate and well delivered. A grappling story about the persistence of inequality in the late 1900s and the effect of political turmoil, prescribed by different viewpoints. The first few chapters are extremely interesting. Amazing as is. Feels like a large enjoyable meal. I would give the book 5 stars out of 5 stars. Overall the book was pretty decent!!! At first when I first picked the book in the library I had thought that it would be boring like many historical books. Therefore I got a surprise when I realized that the book is both interesting and entertaining. My further impressions improved throughout the book as I got dragged into the story unable to stop reading. Every day I read approximately fifty pages. I liked how the combination of historical facts and fiction worked together. Your favourite parts of the book: As I went through the story I was met with more and more surprises that formed so much tension inside me making me want to read on and find out what will happen next. Those parts of the story that build a lot of tension were my favourite ones as they were the most exciting and weird, but in a good way. However my most favourite part was when Nina found out that she was connected to the Tsar's family in a very bad way... She found out that she was a Romanov; basically the target of Bolsheviks and that she was in a family who everybody hated. What you would liked to see more or improved: I would like the book to be twice as big as I could not get enough of all the adventure as Nina and Stephan travelled around. I really enjoyed this book! Though it was a bit of a slow burner, the ending was very good; it was very exciting to see the story unfold. My favourite character was Dr K as he was very kind and caring. I think the book was very realistic as women of Nina's time may have been treated ike objects and forced to marry, like Viktor tried to do. This book did not really intrigue me, or inspire me to find out more about the history of the book.Â It did not speak much about the context of the book, where it was set and time, etc., therefore I do not feel particularly interested by the history of the book. I found the beginning of it a very difficult read as it was not exciting and not very much happened, however I think think was because there were a lot of interesting and complicated characters to introduce. To conclude, I would say this book is worth a read, however not worthy of the Young Quills award. This book was interesting as it was based on true events. It was rather hard to follow as it had confusing parts where it would suddenly switch over. It had a good story line. Nina wanting a better future runs into this boy that wants to help Russia and it has a rather romantic effect. Nina slowly falls under the spell of the monk and that was my favourite part because that was when the action and mostly mystery came in which made it more interesting to read. Although the start was rather hard to follow because chapter 1 goes straight into 'I murdered a man' and that left me thinking I had missed a section [apart from the prologue] altogether. I would give this book a 6/10 because it was hard to follow parts of the story which made you miss the story and I would suggest a 15 year old reads this book. Thank you for reading my report. This historical fiction book by 2nd time author, Theresa Breslin, is set in both Siberia, and St Petersburg, or, as it was known then, Petrograd, in Russia. It is spaced out over the course of 3 years, starting in the summer of 1916, to sometime in 1918, but with the prologue set in 1905, on Bloody Sunday. At first, I found this book a little boring, as it was slow-moving and overly-descriptive, and it took me a while to get into it, but around half way through, it picked up the pace and I really did properly get my teeth into it. The book is centred around 2 characters, Nina Ivanovna, a fair girl, fleeing to Petrograd to her godfather, Dr Konstantin, to escape her stormy past, and Stefan Petrovich, an argumentative trainee doctor, whose past also haunts him. During the course of the book, the perspective switches between that of Nina, and that of Stefan. I enjoyed this aspect of the book, as it let you know two different sides of the story and it helped you learn more about what was going on, at the start of each chapter, you are told which person is narrating. The interaction between the two of them is the central focus of the book, it's the glue that holds the it together and keeps the pace moving. Galena, the strong, independent housekeeper, cares dearly for both students, and looks after them all through their time at home. Near the start of the book, Nina begins a job at the hospital within the Winter Palace, and when the royal family visits, she tells the Tsarevich Alexei a story. She soon receives a letter informing her that she is to temporarily live with the royal family in the Alexander palace. She travels with a mysterious ruby-studded dagger, that her deceased father had left her. 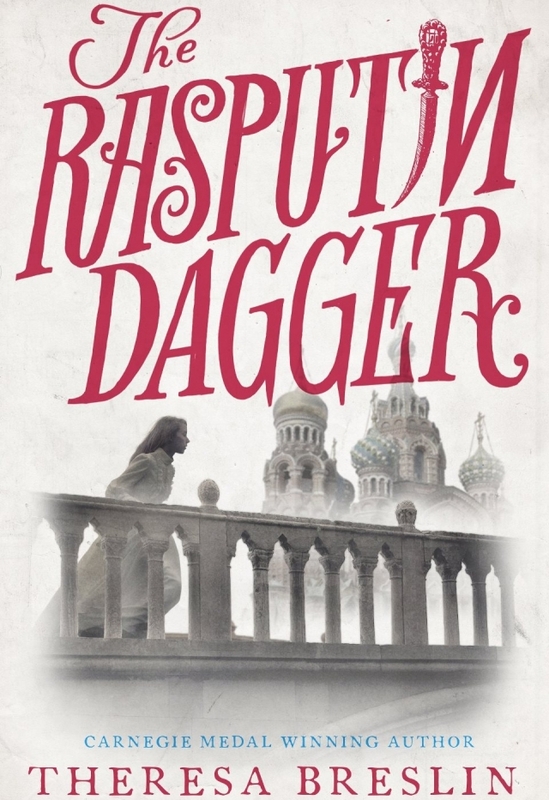 When Father Grigory Rasputin returns to the palace, he wears a dagger in his sash that spookily resembles her own. She is caught up in the lavish life of the royal family, and soon finds herself drawn to the mystery and darkness of Rasputin. But the twin daggers bear a curse, one dagger to save a life, one dagger to take a life. Nina is shaken by this, and it makes a great impact on her life and health. Overall, this book was extremely creative and was a great mixture of history and fiction. The politics were clearly explained, so if you don't have much knowledge of the period, you are not lost. If you take a great interest in it though, like I do, it is not a hindrance to your enjoyment of the book. I think that the writer could have gone a bit less into depth of things at the start of the book, and instead moved on faster. Despite this, I would recommend this book, as it was a true page-turner which I found myself unable to put down once I got into it. I thoroughly enjoyed it and it left my imagination whirring after reading. One danger to take a life. Russia, 1916: a country on the brink of revolution. Nina Ivanovna must escape from the past and find the future but, soon Nina is drawn to live in a royal family which she really does not want and begins to fall under a spell. The person who cast the spell on them lives in a mirror and he owns the red dagger so for Nina to break the spell she has to get the dagger. I have never read a book like this by this author. This allegorical novella lodged deep within Russia in 1916-18, the height of conflict between the occupying Tsar Nicholas on the front lines with millions of bloodied, broken and bruised men (both physically and mentally) warring against the German Kaiser to protect his own. Whilst his German wife, the Tsarina leads Russia into peril with her decisions being spat into her ear by a seducing Grigory Rasputin, monk and 'ruin of Russia' who own a sash that held aloft In it, is a grand encrusted dagger. Taking the reader through a cunning dual narrative between Stefan Kolodin, a young man, losing his mother to a gruesome massacre of peaceful protesters, learning to become a doctor and nursing wounded soldiers to whatever health is possible in the Russian capital of Petrograd (or St Petersburg). And Nina Ivanovna, newly crowned estate owner of a grand house and farm in Siberia after the death of her father, leaving her with a two perplexing mysteries unsolved : the story of her mother's marriage to her papa, and a mysterious gleaming dagger, a ruby at the hilt, peculiarly seeming to be a mirror image of Rasputin's.In the light of her father's death, a sly and troublesome lawyer by the name of Viktor Ilyich Volkov pronounces proudly that he owns the estate now due to unpaid debts from Nina's father, also wanting to marry Nina and steal her inheritance. What follows is Nina's escapade to Russia's former capital, St.Petersburg, or Petrograd, in search of an old confidant of her late fathers, Dr in need of help and a household, whilst her servant Dmitri attempts to manage the estate and mitigate any future actions from the lawyer back in Siberia. At Dr Konstantin's door, Nina is greeted by a young man with tousled hair and a sharp tongue. He introduces himself as Stefan Kolodin, medical student and doctor at the west wing of the grand palace, now turned into a medical centre for maimed men from the front lines. Nina meets Dr Konstantin (or as he very much prefers to be called, Dr K), and Galena, house wife and caretaker of Stefan. Now settled in, Nina begins going with Stefan to his university to study in medical education, like Stefan. Her she meets Stefan's classmates, Tomas, lighthearted and with a grand perspective on humous, Eugene, an introvert who much prefers intimacy between his textbooks than any human can provide, and Fyodor, an extremist against the Tsar's and his royal Romanov family, wanting equality and better living standards for all in Russia. But after a meek period of weeks, Nina starts skipping lectures to instead sneak into the west palace wing to treat wounded soldiers. Here, she catches Stefan with consternations in his eyes at the sight of her, and catches sight herself of the Tsarina and her five children, her four daughters, Tatiana, Maria, Olga and Anastasia, and her 12 year old son, the Tsarevich Alexei who suffered from Hemophilia, making him very unstable health wise, as this made him very vulnerable to blood clots, a simple bruised shin potentially being fatal. After Nina calms him down with a story of her father's, she is invited to come to the royal household of the family to read Alexei more stories. Here, she meets Rasputin, who, as taken a back as she is by their twin daggers, explains that one holds a curse, one cursed to take a life, one blessed to save a life. From this point tension floods throughout Russia, with Fyodor and the Bolsheviks siding with Lenin to overthrow the Tsar, and panic floods throughout the Romanovs, with enraged workers and the most loyal of Cossacks turning against them, Nina and Stefan trapped in the middle of the conflict, just wanting to find a way to survive alive and together. Conspiracy looms in the wind-tipped icy Russian air around the monotone bleakness of the stuccoed working class housing and the grand ivory towers of the Romanov residence in Tsarskoye Selo, as feats of assassination and anarchy become much more commonplace in the frosty tundra. This tale of old revolt intertwined with a classical fable's theme of heartbreak and hearts joined together through thick and thin provide an alluring read, one which can be quite a rare sighting, as not many authors dare to entertain their own perceptions of historic struggles, brought to life through ink and courage to bring to grandiose fruition. May I warn you, this amalgamation of a shrewd mind and a sharp pen will trigger emotions, trigger empathy for characters you will grow to love, trigger hatred for the characters destined to be despised, immerse you into one of Russia's darkest ages with all of the feelings of discord, desperation, desire and disparity that it brings with it, thanks to Theresa Breslin's magical portal that could only be created with such skill as to be thought sorcery. This powerful icon of allegorical writing brings these aspects together, fastidiously I might add, to create a beautiful and ingenious marvel of literature.